Sales of Chromebooks exploded from basically nothing in 2012 to more than 20 percent of the U.S. commercial PC market, analyst firm NPD reported on Monday, while Windows PCs and Macs remained flat at best. NPD estimated that, throughout all of 2013, 14.4 million desktops, notebooks, and tablets were sold through U.S. commercial channels, typically resellers. That compares to 16.4 million PCs, overall, sold in the U.S. during the third quarter alone—excluding tablets, according to IDC. All told, about 46.2 million PCs have been sold in the U.S. during 2013, IDC found. Within that segment, however, NPD reported some intriguing findings. Chromebooks, once largely the province of Acer and Samsung, have been embraced by Dell, HP, and others—not the least of which are paying customers. In 2012, Chromebook sales were “negligible,” NPD reported. But in the space of a single year, they climbed to 21 percent, NPD found, helping push overall notebook PC growth up by 28.9 percent. Windows notebooks, however, contributed nothing to that, as NPD found that growth was flat. Worse still, Macs actually declined, with combined sales of desktops and notebooks falling by 7 percent. 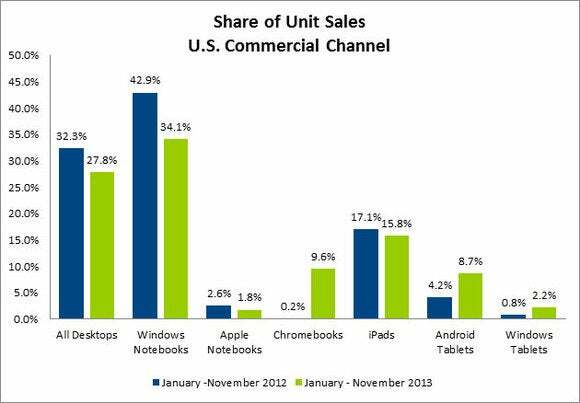 Windows tablet sales tripled, albeit off what NPD called “a very small base”. The message? Businesses are turning to the Web, which Chromebooks almost exclusively run. And those low-cost, Net-focused devices are becoming engines of productivity. As a result, they’re receiving validation from traditional PC vendors including Acer, Asus, Dell, and Hewlett-Packard, plus Google’s own Pixel. Naturally, tablet sales continued to explode, capturing 22 percent(or about 3.16 million units) of all the computing device sales sold through the U.S. channel. Of all tablets sold commercially, iPads dominated with 59 percent of all unit sales, leaving the rest to Android (which grew more than 160 percent) and Windows. Baker said that diversity will be key to the future success of hardware makers, a signpost for what vendors might release at 2014 and the weeks and months following. The Google Chromebook Pixel’s $1299 price tag, is fortunately, an anomaly. As proof, NPD offered its vendor sales rankings, featuring familiar names such as HP and Lenovo. But in fourth place, and closing, is Samsung, whose embrace of Chromebooks and tablets alike propelled it into the top four with 678 percent growth. 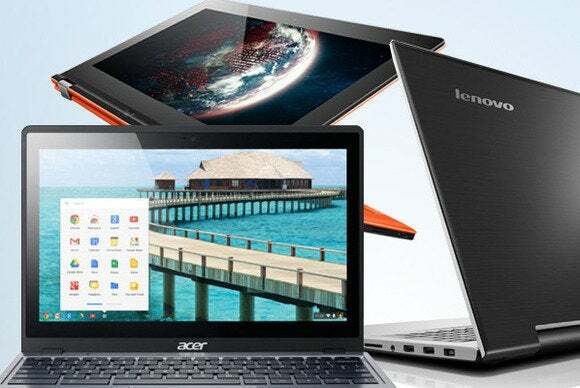 With businesses and consumers alike turning more and more to the Web for work, the low price of Chromebooks has obviously attracted an interest customer base—and, more importantly, validated Chromebooks as a tool for business—overheating charging cords aside. If the trend continues, Windows notebooks won't just have to fend off tablets, but Google as well.